I am obsessed with pretzel rolls. Actually, I’m kind of going through pretzel croissant withdrawal, so maybe I’m just substituting one love for another. 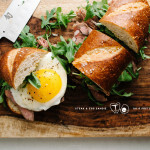 Still, pretzel rolls are pretty damn delicious, especially when stuffed with steak, arugula and a fried egg. I love it when real meals fit into sandwiches, so I’m always looking for things that can be sandwich-fied. 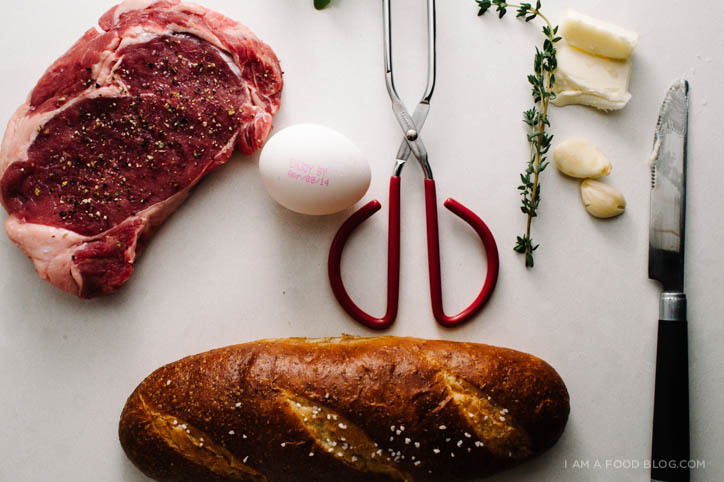 Steak and eggs are perfect for tucking into bread. And actually, I think most things (pasta aside) taste better between two pieces of bread. I kind of get the whole hating on bread thing that the world has going on right now, but I kind of don’t get it too. I LOVE bread. I remember the first time that I learned that bread was “bad.” I had gotten home from high school (so, so many years ago) and was toasting up some raisin bread for an after school snack. One of my brother’s friends was over and I guess she was hopped up on what she was learning in her nutrition courses at university because she went on a thirty minute tirade about how my white flour, sugar-laden raisin toast wasn’t a healthy choice. I nodded along, added some butter to my toast and ate it anyway. It was delicious. I figure, everything in moderation. I’m a super-contrary person and I know it. If I try to tell myself I can’t have X, I’ll obsess about it until I get my hands on some and then overdose on it, even if X isn’t something I’m particularly in love with. However, if I don’t restrict myself, I’m pretty good at making heathy-ish choices (note the “ish”). Healthy or not, this sandwich was pure deliciousness. 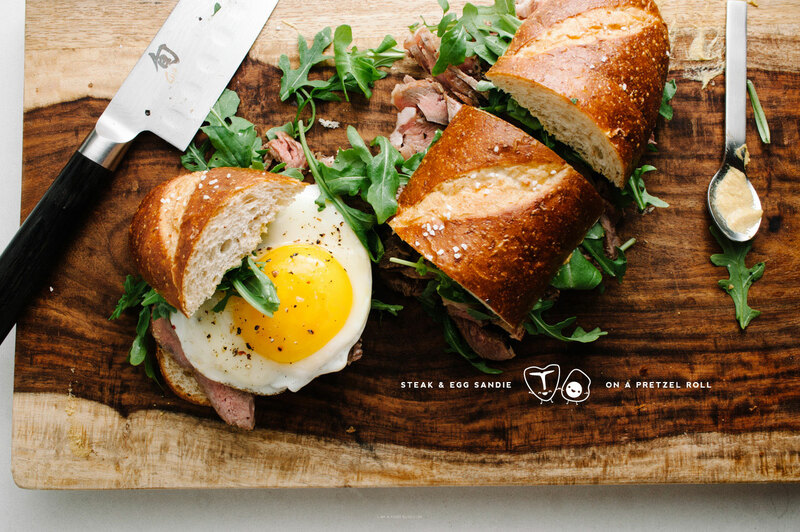 Medium-rare steak, a runny egg, peppery arugula and spicy dijon…ugh, I need another one! 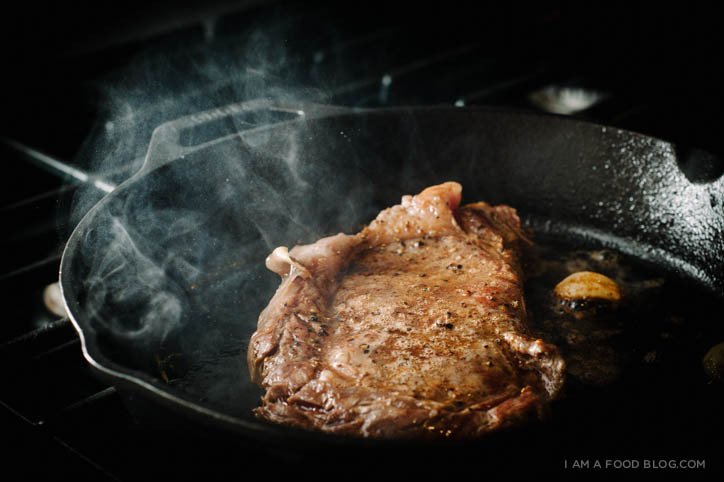 You don’t need to follow these instructions on how I cooked my steak; steak cookery can be a sensitive subject so go ahead and make your steak your way, but if you’re curious, here’s how I did it. Preheat a cast iron pan on high heat. Pat your steak dry with paper towels and season generously with salt and pepper. Sear both sides for 2 minutes each (should be slightly brown and crusty). Turn the heat down to medium, add the garlic, butter and thyme to the pan and then baste with the butter until deeply browned. I know 1 tablespoon of butter is not a lot to baste with, so feel free to add more if needed. Remove from the pan and rest while you fry your egg (or 2 if you and the person you’re sharing with wants an egg). Toast the pretzel roll until golden brown. Smear with mustard to taste. Slice the steak thinly, against the grain and arrange on the roll. 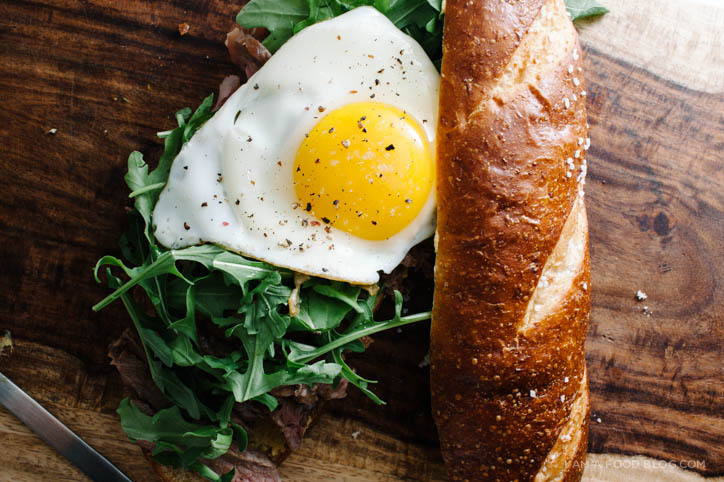 Top with arugula and your fried egg (or 2). Season with salt and pepper and enjoy! “I nodded along, added some butter to my toast and ate it anyway. It was delicious.” HAHA I just lol’ed. Amazing. I’ll stick by bread and your love of bread as long as I live, too — mmmmmmmm bread. 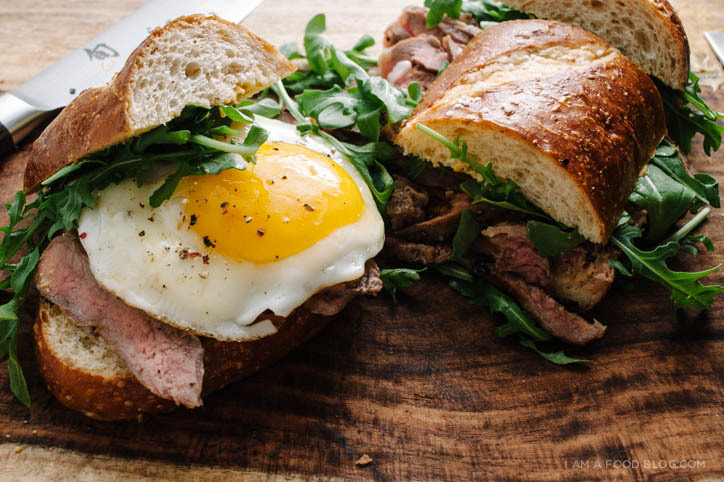 And this sandwich looks AMAZING! THIS looks to die for. Looks a bit tough and messy to eat but I’m sure it would taste great! It was messy, but so, so good! This really looks amazing and I bet it tastes the same. Lovely blog! I must have this. SOON. Oh my gosh. So I came over from instagram and girllll I don’t even eat meat and your blog is like gourmet meatopia heaven, but I am still loving it. Your photos? Gorgeous. Layout? So fresh. Backstory? Hilarious. Yay for husbands who push you (ahem, provoke), right? Also, PRETZEL ROLLS. BEST EVER. There is a local bakery that puts out, no joke, the best pretzel rolls on the planet. Or at least in Houston. 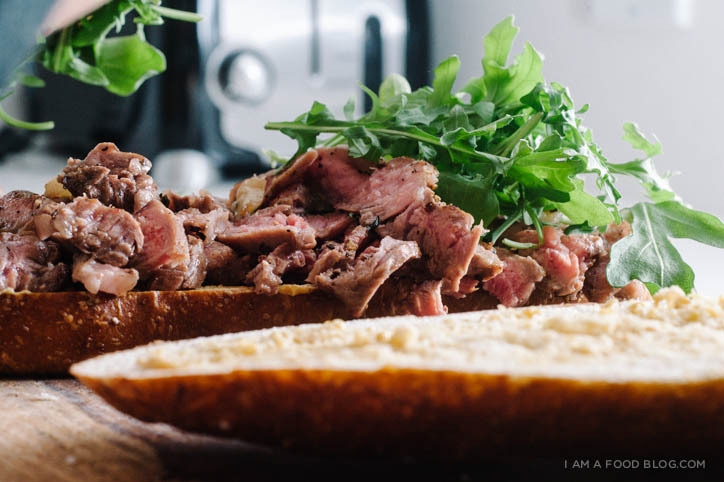 I made some banh mi on a few awhile back and it was just…foodgasm. It made me forget about my love/hate relationship towards bread (it was purely love for those treasured minutes in my mouth) which is good, because, like you, restricting food only makes me nuts about it. Conclusion: YOU’RE AWESOME!!!!!!! And I <3 your blog so so much. Ugh, I would DIE to take food pictures like this! Looks gorgeous and I bet it tastes even better!! Oh man Im coming over to your house!! This looks so good.